Have you ever wished you could hand over your household finances to your own personal money manager? Someone who takes your income and not only keeps everything on track, but also makes it grow? I’m going to let you in on a little secret. You don’t need to hire a financial planner. 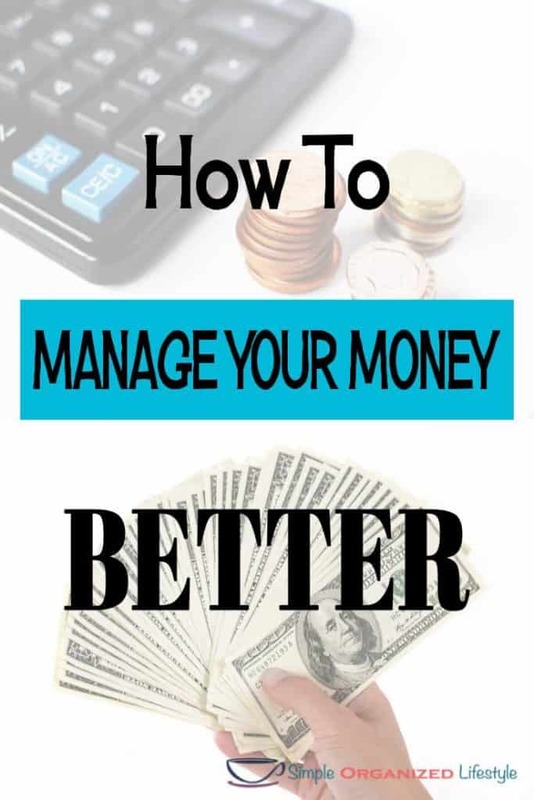 The best person to manage your money better is YOU! I got my degree in managing money better from the school of hard knocks. Simply put, my paycheck was gone each month before I even finished paying bills for the previous month. I felt like I was running in the human hamster wheel of getting nowhere with my finances. Talk about stress. Enter the top 10 ways to manage your money better that I’m about to share with you. I finally had enough. I was tired of the stress and got mad at my debt. It was past time to manage my money better. And now? Now I teach others ways to manage money better because these things changed not only our finances, but our lives and our future. Let’s do this! I devote a good portion of this blog to getting your home organized and that also includes your finances. Before you can manage your money better, you have to know what you have and where you have it. To get started, set up a system for paperwork and bills. Put your bill due dates on your calendar and set reminders. Avoid late fees like the plague! Set up your online banking so you can keep a check on your bank account status every day. Just getting your money organized will save you money! It will help avoid overdraft fees, late fees and all of the other fees that send your hard earned money down the drain. P.S. I loved using online bill pay through my bank until, you guessed it, I noticed a fee for using the service. In the past, I would have gone weeks, or maybe months, without finding this extra charge. These are the kinds of things you can prevent when you organize your money. Having a budget is like having your own Uber driver for your finances. The budget tells your money where to go (checkings/savings/bills), where to slow down (expenses), where to speed up (income) and where to make a u-turn. Even better if you have a car that drives itself (automation is ah-mazing)! Not having a budget is like being in the passenger’s seat with your finances. You know where you want to go and have an idea of how to get there, but your hands are not on the wheel. A budget puts you in control of your finances. It lets you determine how much is coming in and decide where it’s going out… with the first stop being your savings account! Where do you start with a budget? There’s no resource I trust more when it comes to creating your first budget than Rosemarie’s 90 Day Budget Bootcamp. She simplifies the process and walks you through it from start to finish. Her budget bootcamp will put you back in the driver’s seat! Money is evil. My finances will never get any better unless I make more money. People who have money are smarter than me. If these are your thoughts, your money will follow them. So if I think money is a great tool, if I think my finances will get better without making more money, if I think I’m smart enough to have and make money… it will just happen??? Your money will follow your thoughts. Our mindset is more powerful than the money itself. If we think of money as a great tool, we’ll start to use it that way. If we think our finances will get better without making more money, we’ll find a way to do more with what we have. When we think we’re smart enough to have and make money, we’ll believe it and make it happen. I said above that these tips were not in any particular order of importance, but this one is key to managing your money better. Without it, none of the other things you do will be effective. If you want to change your money, change your mindset. You can learn how to manage money without going to college for a degree in finance. I started with books and blogs. I went to conferences, took (mostly free) courses and Financial Peace University. One of the first podcasts I listed to was Radical Personal Finance and my newest favorite is the Fire Drill podcast. There is a saying that you are the sum of the five people you spend the most time with. Come follow me on Twitter because I can assure you it is the hang out spot for money nerds and I hang out with most of them (and feel honored to call some of them friends.) There are tons of great articles that range from how to manage your money as a beginner to investment options so your knowledge grows as your money does. According to Sir Francis Bacon in 1597, Knowledge is Power. A lot of things change over the course of 400 years, but that saying has stood the test of time. Learning more about how to manage your money is indeed knowledge that is powerful. You can’t live the Kardashian lifestyle on a limited budget. You can’t keep up with the Jones’ and get ahead with your finances. Or just listen to my granny who says “they are living too high on the hog” which translates to eating filet mignon when the budget is built for pork chops. Being frugal sometimes gets mistaken for being cheap but the two are different. 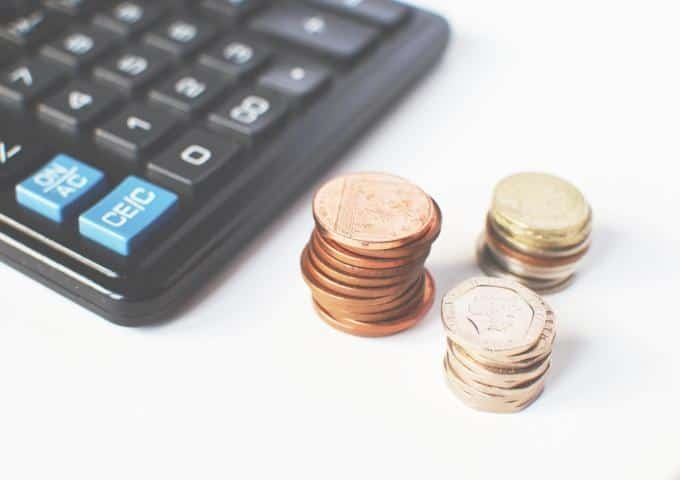 Being frugal means that you are careful with your money while being cheap (could) mean you go a little too rogue when it comes to saving a dollar. One of my friends dated a guy years ago who told her that if he was paying for her meal that she could only eat certain items on the menu. Then he would ask the cashier if they would charge less if they left off the onions at……… McDONALDS. Frugal in this case may have been ordering water instead of soda and skipping the “super size” but this ex-boyfriend crossed over to the cheap side! Frugal living is not doing without. It’s living life to the fullest by finding fun activities to do for free or picking up good habits to save on the power bill or stockpiling as a way to save money. I can honestly say that I find frugal living to be a challenge that is both fun and rewarding when it comes to managing money. There are so many benefits to automating everything you can when it comes to managing your money. Automating savings, investment accounts, and payments will free your time and help you avoid late fees. One of the first resources I turned to for understanding more about personal finance was books. One of the common, repeated themes in many of the books I read was to “Tell your money where to go.” Hmmm. My money already had a destination… the bill collectors, the tax collectors, the grocery store, the gas pumps, and the list goes on. If I could tell my money where to go, I’d easily tell it to go straight to my pocket. Then it dawned on me. That’s exactly what it means! I was trying to over analyze something that was meant to be simple in the world of personal finance. If you want to achieve financial freedom, you have to tell your money where to go instead of the other way around. Automation is the easiest way to tell your money where to go! Technology makes it easier than ever to see where our money goes and make adjustments. Tools and software to manage your money can be helpful and many are simple to use. A tool like the 90 Day Budget Bootcamp will get you started! My favorite app for budgeting is the Every Dollar App. When I first started budgeting, my tool was a faithful old legal pad. Then, I started putting everything into Excel. An app like Every Dollar made things even simpler. Now I just copy the previous month’s information to the next month and make minor adjustments. The easiest way to manage your finances with goal setting is to set short and long term goals. Short term goals may include setting an amount you want to have in your savings for an emergency fund. Long term money goals could may include your retirement plans and how to fund those plans. 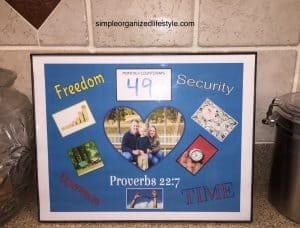 A great way to stay focused on your money goals is to create a financial freedom vision board. A vision board is simply a collection of images or words that remind you of your goal. Goals help us stay focused and motivated when it comes to managing our money better. You can be the best at managing your money but if you don’t have shared goals with your spouse or children, even the best money management plan will not work. I wrote about getting your spouse on board with the budget as well as budgeting tips for couples. Our kids need to be involved in conversations about finances too. What’s your favorite social media account? The one that you check multiple times a day and sneak a peek on your smart phone during the work day for a quick update? If you treat your bank account like your favorite social media account, it will become much easier to keep tabs on your money and manage it easier. It helps you avoid potential problems and tells the story of your day to day finances. For us, managing our bank account as if it were social media has really given us a picture of where we do well (savings) and where we have a lot of room for improvement (food). It’s hard to know what to fix if you can’t really diagnose it. Keeping a close watch on your accounts is an important way to manage your money better. Anything to add that has been helpful to managing your money better? One thing is for sure, any way that you find to manage your money better is a step in the right direction to improving your finances! My wife does this better than me. She has maybe ten seperate emergency funds. I tend to have one big one. As far as organizing bills, I use the Mint app and an Excel spreadsheet. My spreadsheet projects my bills – and how much money I’ll have – for the next two months. Mint is nice, but it doesn’t project where I’ll be – it just tells me where I am at. I don’t think I’ve ever really had a negative mindset about money. Before I had a job, I volunteered a lot, so it made me wonder how could I ever work for money if I’m willing to work for free? Once I got a job though, I didn’t have any qualms about collecting a paycheck. I’m a lifelong learner – about money, or about anything else. For the most part, I do. I’m always trying to learn ways to cut expenses. Sometimes I feel as if there’s nothing more to cut, but I still try to learn. I’m very hands-on, so I’m actually not a big fan of automation. Plus, I don’t really trust it, I’ve heard too many horror stories. That said, I do have my check direct deposited in a few different accounts, including my emergency fund and my Roth IRA. Excel and Mint for me. I’ve got a six-year plan (down from a seven-year plan last year!) for my finances. I guess this is long term? Right now it’s just me and my wife, excluding, of course, family that doesn’t live with us. We are totally on the same page, which is awesome. I actually have to limit myself from checking too often. It doesn’t change much more often than once a day! Sounds like you are doing a great job with money management- wish I had learned these things a little sooner:] It’s great that you and your wife set and agree about your money goals together, that makes things so much easier. So far (knock on wood) I haven’t been burned by automation and I trust it to work better than my memory, but that’s a great point about being more hands-on. Wish you all the best with that six-year plan, it very well could happen even sooner than you think!